The Crown, Netflix's new miniseries about the life of Queen Elizabeth II, is now available for streaming! It's a gorgeous series. 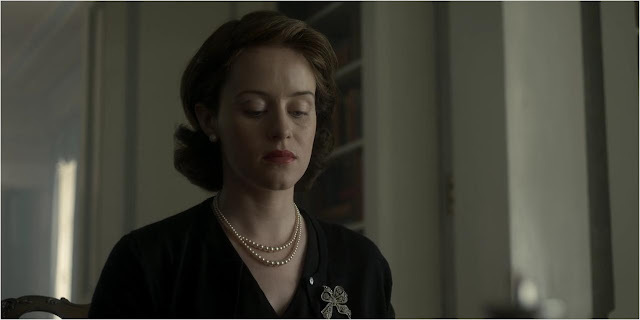 Claire Foy sold me on her portrayal of Elizabeth from her first scene, when she got the hand clasping just right (it sounds like a minor detail, but - thanks to this little blog - I've watched plenty of videos of The Queen in audiences and investitures, and I recognized it immediately). Matt Smith was a little harder to buy as The Duke of Edinburgh, until he nailed Philip's attempted jokes in a receiving line. John Lithgow's Winston Churchill might just be the best of them all. I'm three episodes in, and loving it so far. Some people are sticklers for absolute historical accuracy in this kind of thing. I'm not; they're dramatizations for a reason, it's only understandable that the story gets altered. I am, however, a stickler for the details, and it won't surprise you that the accuracy of the jewels is the thing that tends to bug me first. In this case, though? 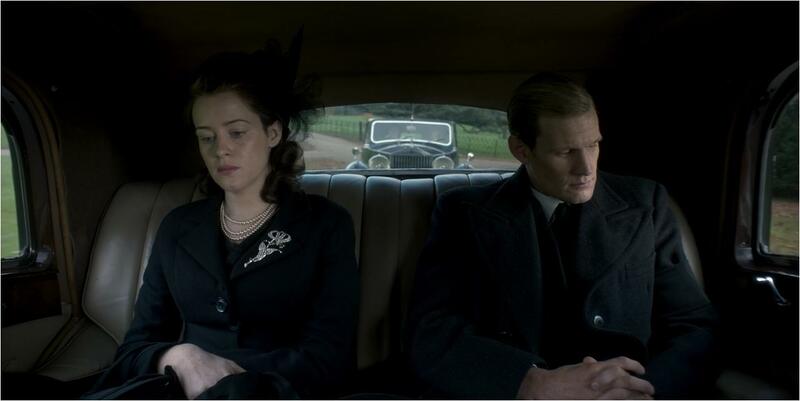 They've taken great care with the details, more care than I usually see in a royal drama. They've reproduced several famous pieces of The Queen's jewelry, and I'll be recapping those identifiable pieces here. Jewels on film are tricky. Fake stuff pretty much always looks like fake stuff, that's just the way it goes. So I judge based on how much attention a film pays to what really would have been worn, and not just on how closely they match the originals. First up: Episodes 1-3. I'd issue a spoiler alert, but...well, you should know the story by now. Episode 1: Photos of the cast filming the wedding were among the first looks at this production, and they immediately highlighted one of the trickiest parts about copying the jewels: the scale. But those photos also highlighted for me the amount of care they were taking with the jewelry, based simply on the fact that they even bothered to reproduce the Duchess of Teck Earrings in this much detail. 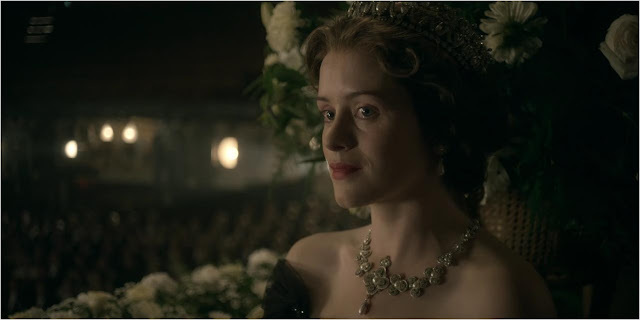 Also represented here are the Queen Anne and Queen Caroline Pearl Necklaces, along with Queen Mary's Fringe Tiara, which looked great. Episode 1: Queen Elizabeth and Queen Mary are pretty much spot on in the jewel department. 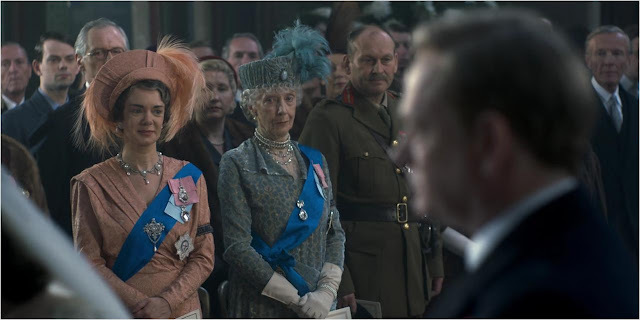 The Queen Mother did wear Queen Alexandra's Wedding Necklace and Queen Victoria's Diamond Jubilee Brooch; Queen Mary did wear the Cullinan III and IV Brooch. Episode 1: Ah, the Flower Basket Brooch! An essential, and this is absolutely the era when Princess Elizabeth would have worn it all the time. Episode 2: That's an impressively faithful copy of the intricate Flame Lily Brooch (if a little on the big side) and it's a crucial one to nail as she returns to the United Kingdom after becoming queen. Episode 3: A bow brooch is essential, even if this one isn't identifiable as any in the real collection. 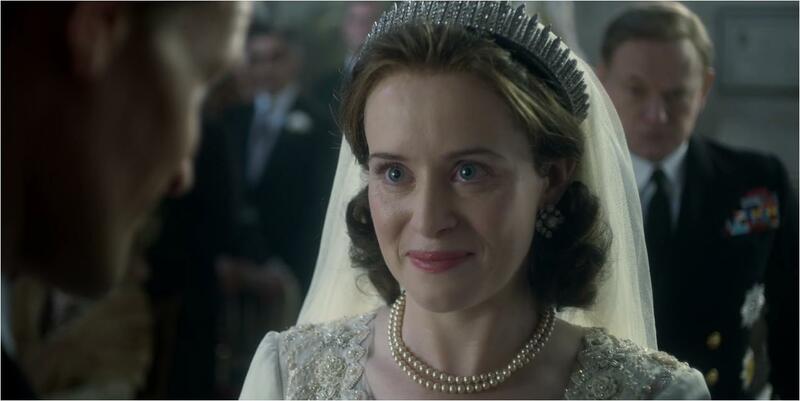 Episode 3: This would be the Cambridge Lover's Knot Tiara worn with Queen Victoria's Golden Jubilee Necklace. That seems a herculean task, copying that busy necklace, right? For the attempt alone, they have my respect. To be continued... Jewel recaps of the next episodes are coming up later. Feel free to chat about the series as a whole here, and don't miss it streaming on Netflix now!